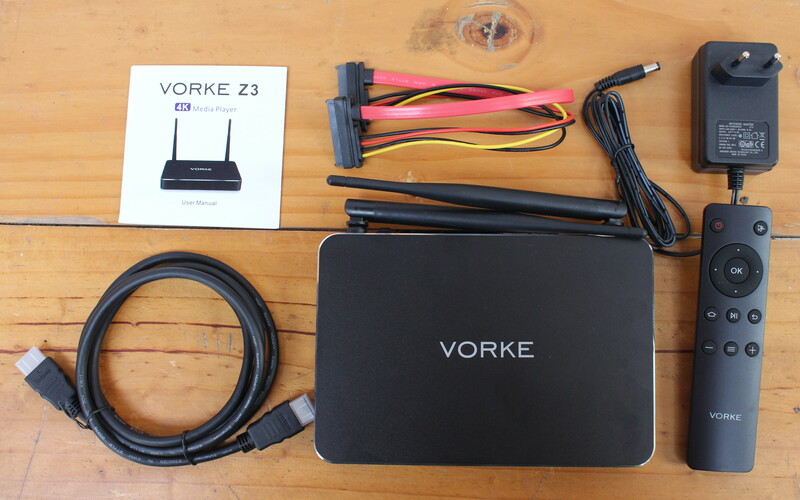 After Yundoo Y8 review, I’ve received another Rockchip RK3399 mini PC for review: Vorke Z3, which was sent to me by GeekBuying. 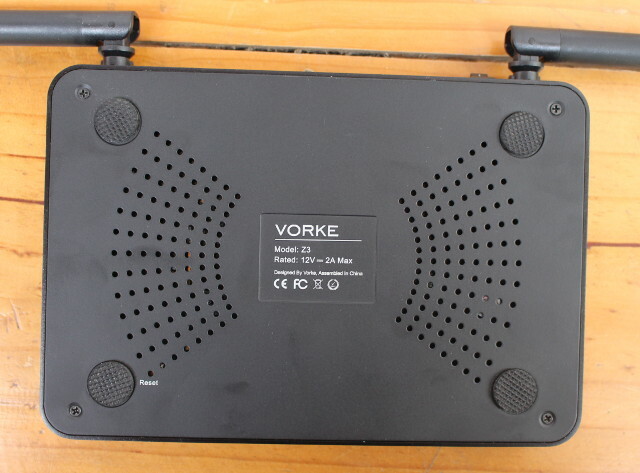 Both devices are quite similar for Vorke Z3 adds an external SATA interface, and two external high-gain antennas. I was also expecting Android 7.1 Nougat on Z3, but I’ve been told the current SDK has too many bugs, so the device still ships with Android 6.0.1. I’ll start the review by looking into the hardware inside out, before reporting on my experience with the firmware in the second part in a few weeks. The retail package is quite bland, but most people will probably not care a bit about this little detail. 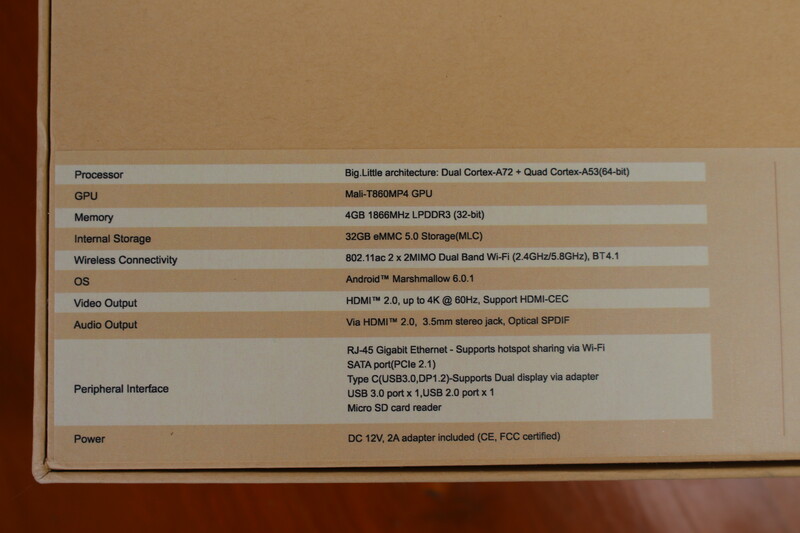 The devices ships with a 12V/2A power supply, a simple IR remote control, a HDMI cable, a SATA cable, and Vorke Z3 “4K media player” user manual. The device feels of good quality with its metal enclosure. 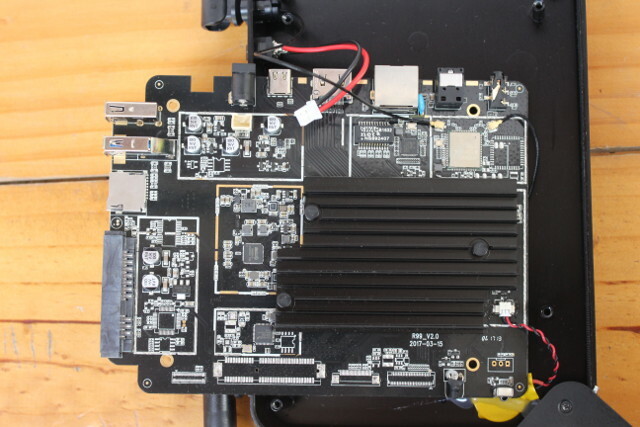 The front panel is characterised by its long ventilation holes, one of the sides come with a USB 2.0 port, a USB 3.0 port, a micro SD slot, and the SATA connector, and the rear panel features the rest of the connectors and ports: two WiFi antennas, a 3.5mm audio jack, optical S/PDIF output, Gigabit Ethernet, HDMI 2.0 port, USB type C port with USB 3.0 and DisplayPort 1.2 (requires separate adapter), power jack, and power switch. 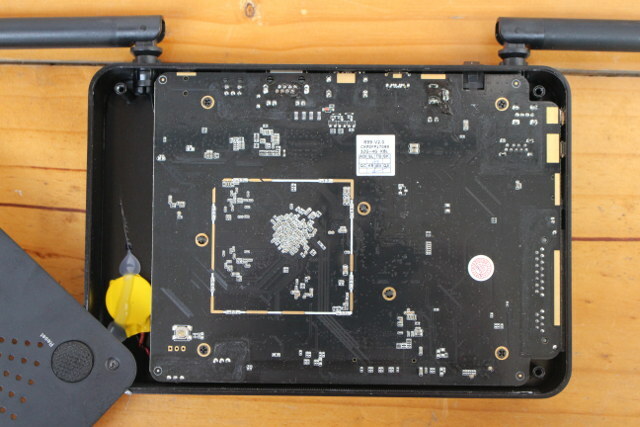 You can disassemble the device by loosening the four screws on the bottom of the case. I started with a precision screwdriver, but I had to upgrade to a larger screwdriver since the screws were too difficult to take out. I actually damaged one with the precision screwdriver, and I could only remove three, so I had to very lightly bend and rotate the bottom cover. There’s no much to see here, except the RTC battery, and a sticker for “R99-V2.0” board. 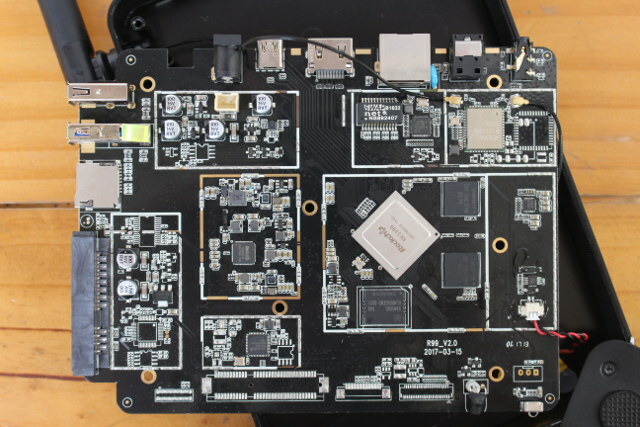 If we remove four more screws, and disconnect the cables to the power switch we can ckeck out the board with the processor, memory and eMMC flash covered by a large heatsink. The heatsink is very easy to remove, and includes a large white thermal pad underneath. 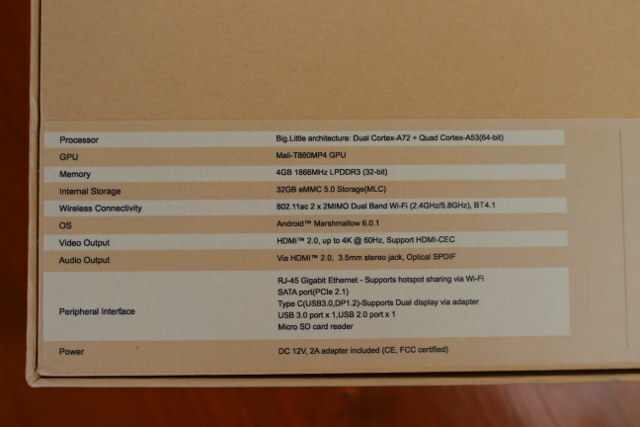 Rockchip RK3399 processor is connected to a “Mainstream” 32GB Samsung KLMBG4GEND-B031 eMMC 5.0 flash (250/100 MB/s R/W, 6.5K/12K R/W IOPS) which should provide very good performance, and two Samsung K4E6E304EE-EGCE LPDDR3 RAM chip (4GB RAM). Gigabit Ethernet is implemented via Realtek RTL8211E transceiver coupled with a SWAPNET NS892407 transformer, and while an Ampak AP6356S wireless module brings 802.11ac 2×2 WiFi and Bluetooth 4.1 LE connectivity to the device, and is indeed connected to the two antennas, contrary to some other devices that use dual antennas for aesthetic purposes. SATA has been properly implemented as R99 board designers leveraged Rockchip RK3399 PCIe interface with ASMedia ASM1061 x1 PCI Express to 2x SATA 3.0 ports. Other chips include Rockchip RK808-D PMIC, and Everest Semi ES8316 low power audio codec. I’d like to thank GeekBuying for proving Vorke Z3 review sample. You can purchase the mini PC from their website for $164.99 shipped. 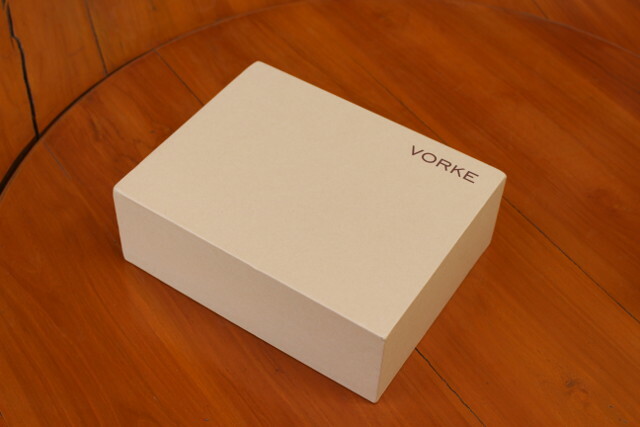 Vorke is a GeekBuying brand so you won’t find it in many websites, but a few resellers on Aliexpress do offer the box. Looking forward to your review, I was waiting for some validation before buying it. If you strip a screw, you can often get the screw out by putting a piece of an elastic band underneath the screwdriver point, and pressing it into the screw while turning. FWIW. If that fails, you can drill out the centre of the screw (start small and go slow). Another option that usually works very well for electronics is to go buy a set of cheap, tiny drill bits and then superglue or epoxy the the drill bit to the screw. Safest way is to dip the drill bit into the glue and then affix it to the screw and let it set. You may have to throw away the bit but you’re not drilling around a circuit board (metal shavings always make me nervous, they can find their way into the damnedest places and cause a short). Looks like a cleanly designed and featureful board. While it’s still a bit expensive for a dev board, it’s actually a very powerful PC which could even make a small workstation for development and various activities (eg: run the arduino IDE, etc).